Each round players receive 20 cash and some worker cards (which come in 5 different colours). Then, players take turns performing one action each until all players have used all of their cards. To take an action, a player must place 1 of their worker cards face-up onto one of the limited set of spaces for worker cards next to the selected action. However, if a worker card has already been placed on that action’s spaces then any new cards for that action must be of the same colour as the card already played. If a player can not (or doesn’t want to) play a matching colour card, they can place any 2 cards face-down instead. To earn VPs, players need to build towers which must comprise of a turret and a base, plus any number of middle sections. Also, all the tiles in a tower must be of the same colour (there are 5 colours in total). Before a player can build a tower, they need to buy the tower tiles. On the board, there are 4 markets (1 for turrets, 1 for bases and 2 for middle sections) offering some randomly dealt tower tiles. Each market has its own set of action spaces and the purchase price of any tile is determined by the tile’s colour. Some tiles have a gold emblem on them which earn VPs at the end of each round so those are highly sought after too. Buying tower tiles is one thing, but you need to build them to score VPs which is a separate action. Each space where the worker cards are placed for building determines the cost of building, but also determines how many tower tiles they can add to their towers that turn. When building, players can build new towers as well as add middle sections to existing towers to make them taller. Other actions allow players to get extra cash, become first player next round, and bribery which lets the player pay money to look through one stack of the building tiles yet to reach the markets and buy one. At the end of each round, players score 1 VP for each tower, each gold tower tile (plus 1 VP for the start player). At the end of 4 rounds, the game ends and the big scoring takes place. Players get points for (a) having the tallest and 2nd tallest tower of each colour (the towers whose tiles cost more score more VPs), (b) having the most and 2nd most towers (regardless of height), and (c) having the tallest tower in the kingdom. 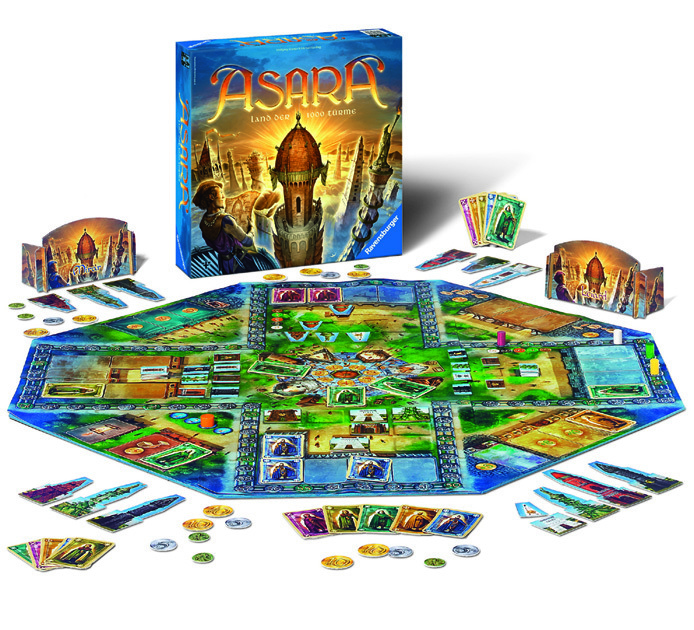 Overall, Asara was more interesting than the relatively simple rules first suggested. The game plays quickly as each action is very short so downtime is minimal. There’s lots of choice on what you can do with your actions, but I like how the cards that players lay down at the start of each round are likely to reduce your possibilities as it gives you a framework to work within rather than an completely open choice every time. The card placing game mechanic is simple but I like how it makes you think about how to get the most out of your cards. Being the first player to place a card next to an action affects all the other players. Using 2 cards to perform an action is very useful but means you’ll have fewer actions. The limited set of action spaces as well as the limited building tiles available for purchase each round adds an exciting tension to the game. You are often waiting and hoping the action and/or tile you want next is still available/possible when it’s your next turn. Watching what other players have bought, and your position in the turn order, is important so you avoid taking tiles/actions which won’t end up being useful because of what another player takes. Interaction is high because most things other players do affects you and other players’ actions force you to keep considering other ways you could use your actions/cards for greater effect. However, this is indirect interaction so it’s not an aggressive game. The different scoring opportunities mean players can pick different strategies for collecting VPs, but you do need to excel in whichever areas you are competing in, or you can end up scoring nothing (i.e. if you have 3rd tallest green tower, or the 2nd tallest building in the kingdom). The artwork is colourful and looks great (although these giant towers which you keep making bigger, and then compare who has the biggest, does have a rather phallic connotation). The board is made of a set of jigged sections creating a cross with the gaps in between filled by triangular pieces. Two of these triangular pieces can be flipped over for optional advanced actions. I think it would be great if extra triangular board sections were released (like the Spiel promotion) which add new or alternative elements to the game. I am interested to see how it plays with 2 players and I’m expecting it will be a very tactical game. Whilst tney get a few more cards, I thought 2-player games might get fewer action spaces to fight over, but maybe the more certain knowledge about what the opponent is doing means it would be too easy to block an opponent if there were fewer action spaces. 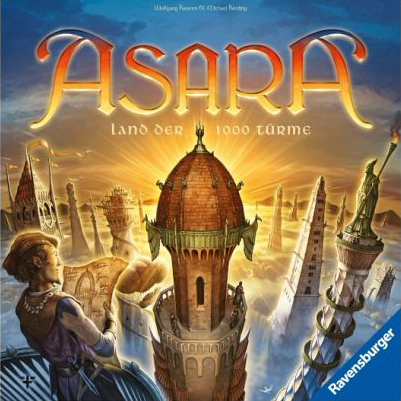 I’ve heard that there is a multi-lingual version available (Swiss or French); however, anyone wanting to play in English can buy the German version (like I did) and get the rules from the BoardGameGeek site as the game is completely language independent. 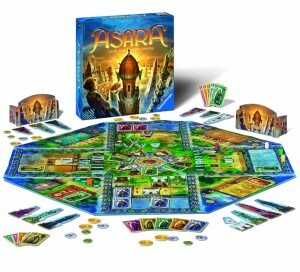 I expected Asara to be good but I was pleasantly surprised how solid and entertaining it was. This entry was posted on Friday, December 17th, 2010 at 10:14 am	and is filed under Asara, Board Games. You can follow any responses to this entry through the RSS 2.0 feed. You can leave a response, or trackback from your own site.